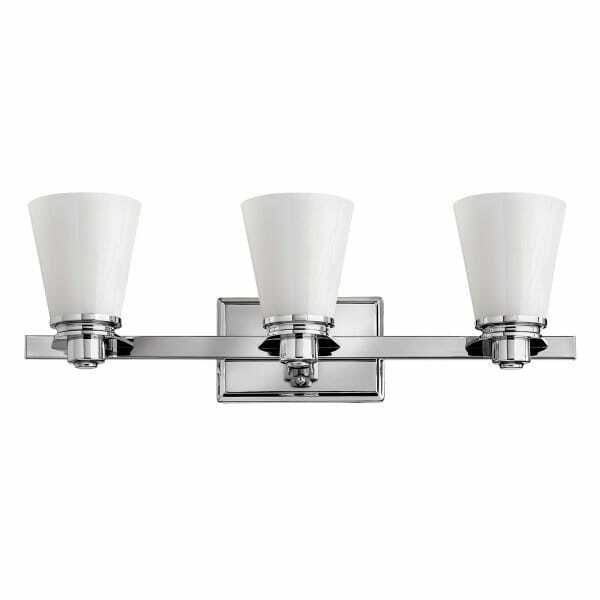 The Avon 3 light bathroom wall light designed in the USA for UK use. Perfect for homes or hotel guest rooms. With its updated traditional style and hint of Art Deco this triple wall light will fit easily into both traditional and more modern bathrooms and is the perfect choice for lighting over a bathroom mirror. The image shows the light pointing upwards can also point downwards making this a great over mirror light. Giving lots of light where it's needed. The chrome metalwork fits well with chrome taps and fittings and the opal glass shade ensures the bulb is hidden from view. It has an IP44 rating that allows the fitting to be used safely in bathroom zones 1 and 2.